Critically acclaimed for The King of Hearts in Saint Etienne Opera, Aurélie Ligerot is distinguished by “A flexible phrasing, a luminous timbre, clear highs, and a dramatic sense and perfect gestures” (Concertclassic.com, March 2016 ). She performs in the major French houses such as the Théâtre du Capitole in Toulouse, The Opéra National de Bordeaux, the Opera companies of Avignon, Marseille and Toulon where she sings the tribute of honor in Macbeth and the high priestess in Verdi’s Aida, Anna Kennedy in Donizetti’s Maria Stuarda, Andreloun in Gounod’s Mireille, and Bianca in The Jano Rondine in Janaček’s Jenufa. 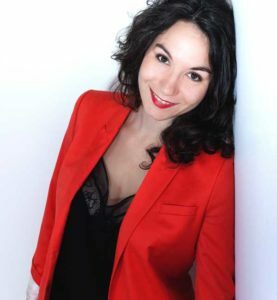 Parallel to her studies at the Conservatoire de Bordeaux, the operatic company Opera Bastide has offered her principal roles, including Pamina in Die Zauberflöte, Fiordiligi in Mozart’s Cosi Fan Tutte, and Michaela in Carmen. Abroad, she sings Donizetti’s Love in Sarzana (Italy) and Violetta in Verdi’s La Traviata at the Hamburger Kammeroper (Germany), and recently Leïla in Bizet’s The Pearl Fishers at Opera Romana Craiova (Romania). Her repertoire of sacred music includes Bach’s 140 and 150 cantatas, Zelenka’s Missa Votiva, Mendelssohn’s Symphony 2 “Lobgesang”, Rossini’s Small Mass, Carmina Burana by C. Orff and Poulenc’s Gloria. She has regularly performed with Antoine Chenuet, director of the program The Night Romance, and with the pianist François Henry in a work based on Théophile Gautier: Théophile Gautier, Muse of the Composers or One Does Not Trifle with the Melody, a program based on de Musset’s work with Jacques-François Loiseleur des Longchamps and Stéphanie Humeau. Her solo recital Désire[s] provides the beautiful part of the verist repertoire. This season, she takes on the role of Violeta in Traviata with the company Figaro Si Figaro Là. This recital will be on May 25 in a musical conference by Brigitte Durup on Verdi with tenor Olivier Trommenschlager. Born in 1978, he began playing the piano at the age of 8. Admitted to the National Conservatory of Paris (CNR) in 1991, he entered the piano class of Pierre Réach and Marie-Louise Langlais organ. He works in parallel with Laurence Allix, renowned pedagogue. 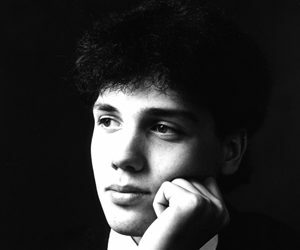 In 1993, he won the Ermend-Bonnal Prize of the first André Marchal International Organ Competition in Biarritz. In 1994 he attended the National Conservatory of Music (CNSM) in Paris, studying piano with Jean-François Heisser, and chamber music with Christian Ivaldi, and winning first prize in piano. He then took master classes with Rena Shereshevskaya in Colmar, while continuing his studies at the CNSM in Paris. Simon Adda-Reyss has the privilege of receiving frequent advice from the master Olivier Messiaen. Both on the organ, on the piano and as a soloist or orator, he regularly performs in Paris (theater Châtelet, auditorium of the Musée d’Orsay, home of Radio France, etc), in the provinces, and abroad; notably in Moscow where he played in the grand hall of the Tchaikovsky Conservatory under the direction of Yuri Bashmet, and then in Japan, where he will perform again this year in Tokyo as part of the Ginza Chanel Chamber Music Festival. He was the accompanist of the singer Jane Rhodes. Recently, he played in the story of Babar F. Poulenc with actress Marie-Anne Chazel. Simon Adda-Reyss improvised the music of the modern series of drawings, broadcast on Canal + in 2000/2001. That same year, he was also chosen as piano accompanist by actor François Morel. 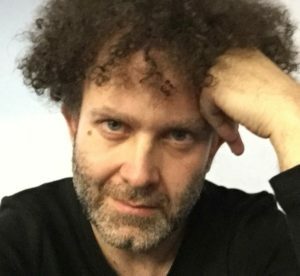 Always passionate about teaching and the transmission of knowledge, Simon Adda-Reyss holds the C.A., obtained under the supervision of the higher education of the National Conservatory of Music of Paris. In 2008, he was appointed Assistant Professor at the same school. Simon Adda-Reyss also performs in partnership with the violinists Julien Dieudegard, Akiko Yamada and Nemanja Radulovic, the cellist Atsushi Sakai, and the singer Simon Edwards. 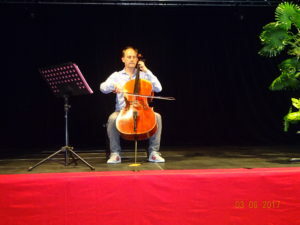 Nicolas Hartmann studied cello with André Navarra and Philippe Müller at the CNSM in Paris where he won a first prize in cello and chamber music in 1981. He then perfected himself at the Geneva Conservatory in the class of Guy Fallot and obtained a virtuosity prize in 1983. He followed master classes with Pierre Fournier, János Starker and Boris Pergamenschikow. In 1986, he won the Maria Canals International Competition in Barcelona. He successively became principal cello of the Musikkollegium Winterthur (from 1987 to 1988), of the Orchester des Pays de Savoie (1989 to 1992), of the Geneva Chamber Orchestra (1989 to 1991) and since 1992, he has held the position solo cello of the National Orchestra of Lyon. She started cello at the age of 5. She joined the Strasbourg CNR where she won a gold medal in the class of Jean Deplace. She then perfected with Reine Flachot at the Ecole Normale de Musique in Paris, obtaining the Higher Diploma of Concert, and then with Edmond Baert at the Royal Conservatory of Music in Brussels, where she was awarded the Higher Diploma with Grande Distinction. 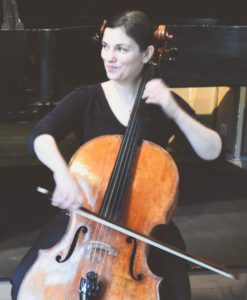 She is the principal cellist of the Symphonic Orchestra “Région Centre Val de Loire-Tours”, with whom she has performed Boccherini, Haydn and Saint-Saëns concertos. She is also regularly invited by the opera orchestras of Paris and Firenze. She participated in 3 creations of the director Thierry Bédard with the company Notoire, “Encyclopedia of the dead”, “The censored Library”, “In Hell” (TGP of St-Denis, national scenes). She has signed many recordings: concerto by Emil Cossetto (Radio France), duets with piano (Sude) and chamber music by Philippe Hersant (Triton). She is a founding member of the trio Pilgrim, with which she records the two trios of Mendelssohn (Triton), performs a complete Beethoven trios at the festival 5X7 in Vevey, and creates in September 2018 a work by Martin Matalon whose trio Pilgrim is dedicatee . Red Radoja graduated from Tirana University of the Arts (piano) and the University of Strasbourg (musicology). He is dedicated to piano teaching at the Luneville Music School, to ethnomusicological research and to the promotion of his works as a concert pianist or director of the chamber ensemble “Le petit opéra lorrain” ‘Ensemble Alliance’ association (Epinal). 2010 “The song of Garrie” suite for piano Éditions Fortin. 2011 “The Dodone Oak” choral (SSAA) Fortin Editions. 2014 “The strength of the brave” (piano) Éditions Fortin. 2014 “The first snow” choral (SATB) Éditions Fortin. 2015 “Hunting on the lands of the Dukes of Lorraine”, suite for piano Editions Fortin. Lyuba Dmitrieva was born on July 7, 1994 in Veliky Novgorod, Russia. In 2018, she graduated with honors from the Gnessin Russian Academy of Music in the genre of People’s Artists of Russia, studying under Professor Friedrich Lips. In 2010 and 2011, she won first prize in the A.L. Repnikova International Competition of performers on folk instruments in Petrozavodsk, Russia. In 2010, she won first prize in the Open All Russia festival competition of children and youth creativity “Golden Boat”. She won the Grand Prize at the “Golden Boat” Open All-Russian festival in 2012 and 2013. She won the Grand Prize at the Russian competition of performers on folk instruments “Gems of Russia” in 2012 and 2013 in Ivanovo. In 2014, she won first prize at the International Competition of folk music ensembles “The Fascination of Singing Strings” in Petrozavodsk. In May 2014, she won the bronze medal at XIII Youth Delphic Games of Russia in Volgograd plus a special diploma for a bright personality. In addition to participating in competitions, Lyuba has a very rich concert schedule. She performs both as soloist and with the Klava band under the leadership of the People’s Artists of Russia directed by actor Anatoly Zhuravlev. She is also a soloist of the instrumental trio. Elena Rigun was born on November 20, 1984 in Kaliningrad Russia. She graduated from music school in cello and then took up the double bass at the Moscow State Tchaikovsky Conservatory where she studied under Professor E.A. Kolosov. She performed with the Kaliningrad Regional Symphony Orchestra, playing in ensembles of various genres and eras, including the baroque, classical, jazz, and folk. 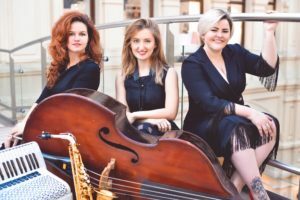 She participated in the bass quintet known as Bass Divas, which became famous for its performances in the Bolshoi Theater in the Tchaikovsky Concert Hall. She also participated in a television project on the federal channel in the show, “Winner”. In 2017, as part of the World Youth Orchestra, Ms. Rigun performed in the city of Sochi. 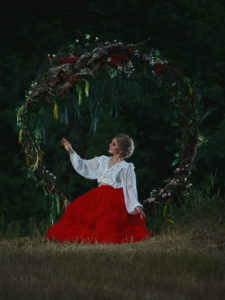 In the summer of 2018, she participated as a soloist of the ensemble of the production and premiere of the opera Crime and Punishment, which took place in Perm as part of the annual Dygilevsky Festival. In 2018, Ms. Rigun won third prize in the International Competition of performers at the Gnessin Russian Academy of Music. Elena Rigun is presently under contract with the Concert Symphony Orchestra of the Moscow Conservatory under the direction of A. Levin. 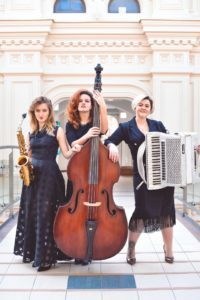 She also plays in the Klava ensemble for a play by Anatoly Zhuravlev, as well as collaborating with the Y. Kkuklachev Cat Theater, where she plays in the quintet for the play “Fluffy Rhapsody”. She was born in 1994 in Irkutsk (Russia). In 2003 she began to study the piano, in 2007 – the saxophone. In 2014, she graduated from the Krasnodar College of Music named after N.A. Rimsky-Korsakov class saxophone. From 2016 I am a student of the 4th course of the RUSSIAN ACADEMY OF MUSIC NAMED AFTER GNESIN, a class of professor M.Shaposhnikova. Ekaterina is a laureate and winner of many international, All-Russian and regional competitions: winner of the “XVI Open South-Russian Competition of Performers on Wind and Percussion Instruments” (Rostov-on-Don, 2014), “X Open All-Russian Competition of Young Performers on Wind and percussion instruments to them. Yu.A.Bolshiyanova “(Krasnodar, 2013), laureate of the 1 st degree competition” Music. Opening. Talent “(January 2018, Suzdal), laureate of the III degree of the III All-Russian open competition of performers on wind instruments. A.G.Nikitanov (April 2018). Extensive experience in orchestras and various ensembles (from 2013 to 2017 exemplary youth pop-jazz orchestra “New Wave” (Krasnodar), saxophone quartets (Moscow). 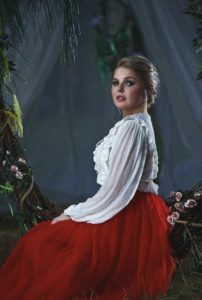 Burlutskaya Olga. Born on 01/17/1992 in the village of Beloozersk, Voskresensky District, Moscow Region (Russia). Graduated from the Gnesins Russian Academy of Music in 2018.